Live stream events are now easier to manage on YouTube. You can now copy settings from previous events, auto-start and there is automatic resolution detection. Small YouTube channels can now join in on the mobile live streaming fun - you only need 25 subscribers to stream from the YouTube mobile app. There was a big update for Google Hangouts Meet for G Suite Enterprise accounts. Now you can record your video calls to Google Drive and include up to 50 participants. And all Hangouts Meet users can use the new Meet hardware, which includes a 4k camera, speakermic, Chromebook and controller. The Google+ desktop notifications page now lets you open notifications in a new tab (hooray!!) and includes hovercards, so you can see more about the person who +1’d you right from the notification list. It's been confirmed that new Google My Business listings can no longer add a Google+ Page or YouTube channel. If you have a local business and want to use Google's social media, you will have to create a Google+ Page on a separate Brand Account, and then add a YouTube channel (or vice versa). The good news: you can have different people managing business listing and the Brand Account with Google+ and YouTube. The bad news: you will have to manage those business identities separately. Earlier this week some Google Docs users found that they were locked out of their documents for Terms of Service violations. This turned out to be an error on Google’s part, with their system that “protects users from viruses, malware, and other abusive comment” incorrectly blocking some files. But the incident has raised privacy concerns from users who did not realize their content was being scanned. Facebook, Twitter and Google testified before Congress about misuse of their platforms during the 2016 US elections. All found that the Internet Research Agency - a sponsored Russian “troll factory” - had used their platforms, placing ads and posting content. Fake profiles have been deleted, accounts were canceled, and the big internet companies say they are implementing procedures to prevent it from happening again. 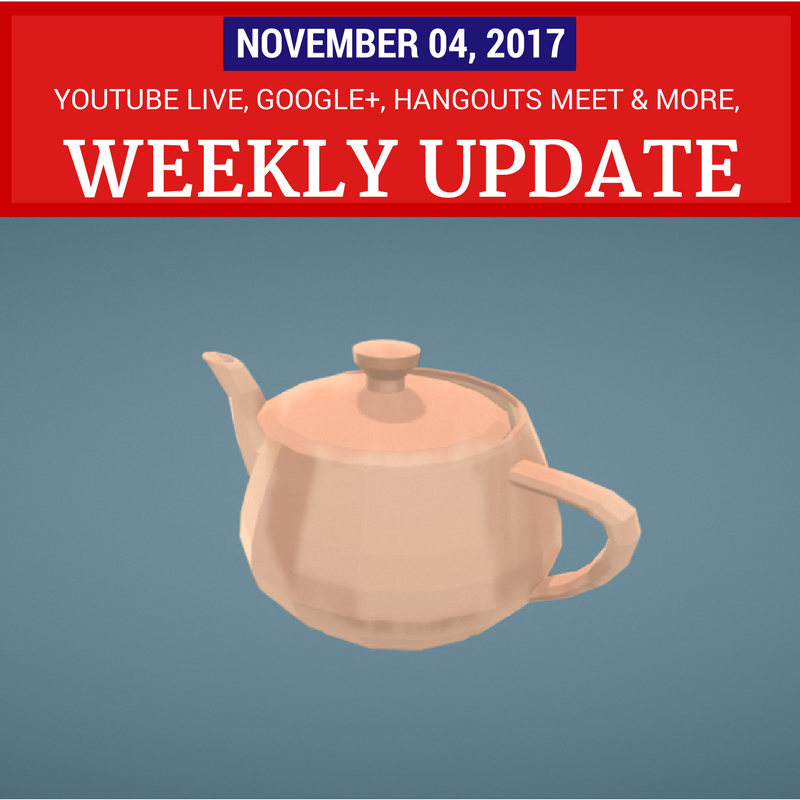 Image: Teapot from Poly by Google. Poly is a new place to browse, discover and download 3D objects and scenes. Always back up your important documents and files somewhere that is not "in the cloud"
Whatsapp update with new features. I like this article very much as it shares the some useful and recent updates regarding Youtube, Google thus helping us to remain updated.